They are what I consider the perfect comfort food. Why? Well, they are usually easy to make, they can be frozen ahead for times when the act of cooking seems to much to bear, and they are a complete meal in one dish. As I said, I love casseroles but I rarely eat them. My husband, you see, hates most casseroles. I am not sure if it is a texture thing, or a visual thing, but he won’t eat them most of the time. Since there are only two of us in our house I try to make meals that will please us both. Nothing is worse than tucking into dinner while your partner sneers at his plate. Not fun. What I do when I am craving my favorite casseroles is find a way to rework the ingredients into a non-casserole meal. 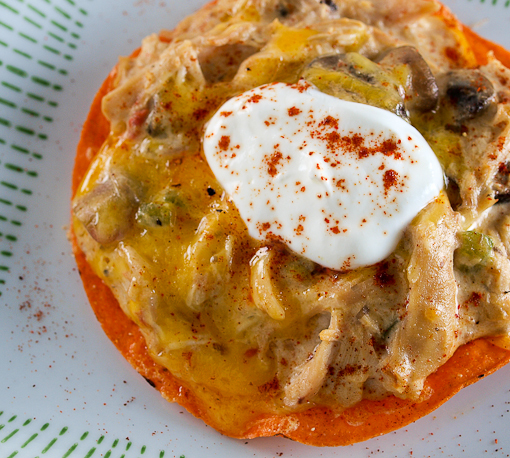 In this case I was craving King Ranch Chicken, a Tex-Mex favorite which is loaded with tender chicken, creamy cheese, and hearty vegetables. What’s a girl to do? She makes tostadas!! 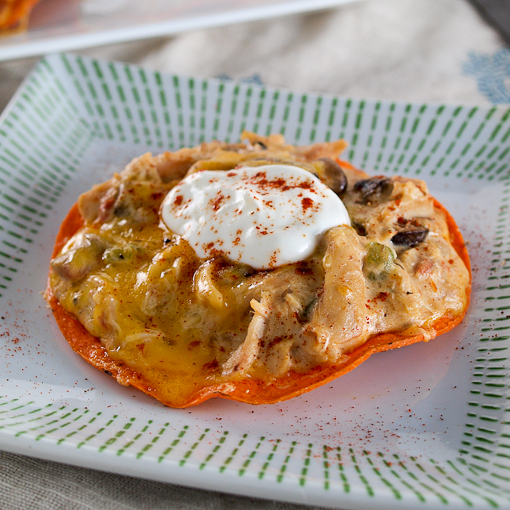 Usually King Ranch Chicken is composed of creamy chicken filling layered with corn tortillas and cheese, then is baked until it’s bubbling hot. As that would not do for my beloved, I decided to use a crisp corn tostada as a base and spread the filling over the top. Basically this recipe is true to the traditional flavor wise, but I did have to make a few small changes. First, I made the filling thicker than usual so it would not run off the tostada. Second, I layered the cheese under the filling, then added a little on top because I love cheese! Finally, I stuck the toastadas under the broiler to melt the cheese, heat up the chicken topping, and make the edges of the tostada toasty and brown. A dollop of cool sour cream on top makes this a fun, and slightly elegant, take on the traditional dish! 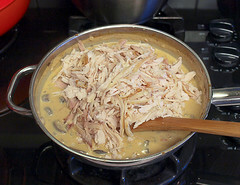 If you wanted to serve this dish for a party might I suggest spreading the chicken filling in a shallow baking dish, topping with shredded cheese and baking for 25 to 30 minutes at 350F? 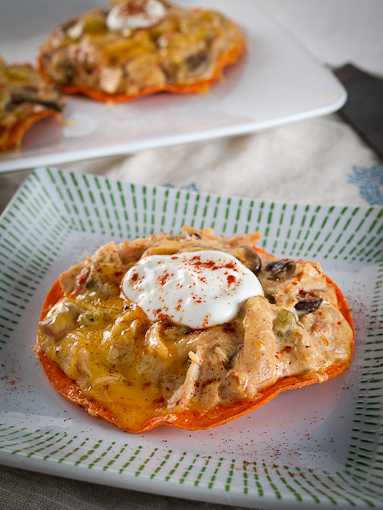 Serve this with some warm tortilla chips an you have a filling appetizer or game day dip! In a medium saucepan over medium heat add the butter. 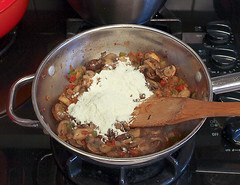 Once it begins to foam add the mushrooms, onion, bell pepper, salt, and pepper. 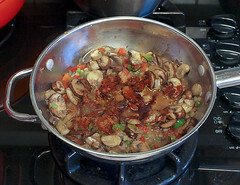 Cook, stirring constantly until the vegetables begin to soften, about 3 minutes. 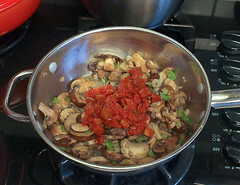 Add the Rotel and garlic and cook until the garlic is fragrant, about 1 minute. Add the spices and cook until the spices are very fragrant, about 3 minutes, then add the flour and cook until the flour is moist and just starting to become golden brown, about 5 minutes. 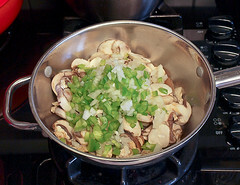 Whisk in the chicken stock and half and half and bring to a boil. Once the mixture boils reduce the heat to low and add ⅓ cup of the sour cream. Mix well then fold in the chicken. 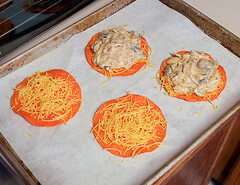 To assemble place the tostadas on the parchment lined baking sheets. 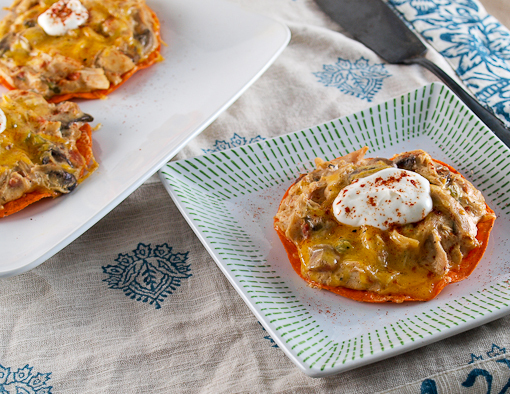 sprinkle 2 tablespoons of cheese on each tostada, then divide the chicken mixture over the the cheese, then top with the remaining cheese and a sprinkle of smoked paprika. Broil for 2-4 minutes, or until the cheese is melted and bubbling and the tostata is toasted around the edges. 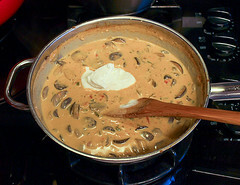 Serve with the remaining sour cream and some additional paprika to garnish.